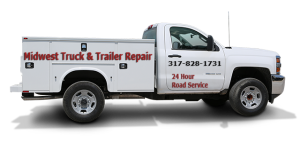 We here at Midwest Truck & Trailer Repair of Indianapolis understand, that when your truck and trailer is not in motion, it is costing you vital time and money to keep your business thriving. Our goal is to provide a quality service at affordable rates! We provide the largest network of parts providers in the surrounding area to ensure problems are resolved in the quickest time by any means necessary! We work closely with dispatchers, drivers, and breakdown departments to guarantee the best results for your company in any given situation. We offer Mobile Semi Truck Repair and Trailer Repair Services! All of your repair and maintenance needs can be handled by our team at your convenience! On a daily basis our professional techs tackle jobs far and wide from glad hand replacement all the way to radiator replacements! Put your mind at ease and make the first call the right one. Mobile Semi Truck Repair Services located in Plainfield Indianapolis.